Jacquie Phelan pioneered the early days of modern women’s mountain biking and introduced some of the first women-specific mountain biking camps and clinics. For someone known across the bike world as the “godmother of women’s mountain biking,” Jacquie Phelan lives a life noticeably absent of material luxury. She dumpster dives for her food and she lives in a minimalist abode that she calls “Offhand Manor,” near the foot of Mount Tam in Marin County, California. If Phelan measures her wealth in time, she’s capitalized on it remarkably. When mountain biking was still searching for its footing, Phelan co-founded the National Off-Road Bicycle Association (NORBA) circuit, mountain biking’s first major governing body. She was a three-time national champion on that circuit in the early ’80s, and between 1981 and 1986, she was undefeated racing in the United States. During that time, she raced on a bike handmade by her husband, Charlie Cunningham, who is also a pioneer in mountain biking. Back then, Phelan’s bike—which she nicknamed “Otto”—was among the first to ever utilize an aluminum frame and drop bars, features that became industry standards in later years. Considering her overwhelming competitive success and technical innovation—which led to her being induction into the inaugural class of the Mountain Bike Hall of Fame—Phelan says her greatest pride comes from never taking mountain biking too seriously (she carefully refers to mountain biking as a “pastime,” not a “sport”) and for the time she spent to lay the groundwork for women’s participation in mountain biking. 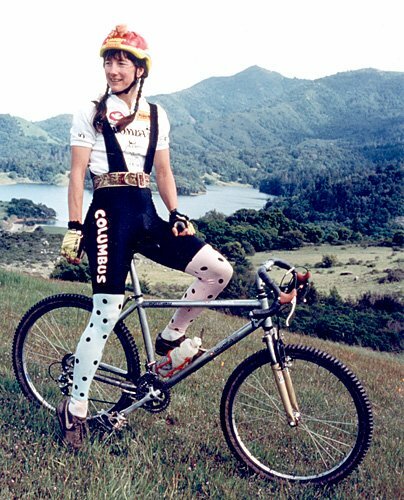 Phelan founded the pioneering group WOMBATS (The Women’s Mountain Bike and Tea Society) in 1987 as a way to encourage “girls and women to try cycling for the fun of it.” WOMBATS was the first-ever women-specific mountain biking camps and riding clinics—established some 30 years before current iterations like Roam Fest. Bocast says she met Phelan a few years ago, when she was brand-new to mountain biking. She remembers Phelan as “down-to-earth, quirky as hell and unbelievably welcoming.” Bocast says she tries to recreate that fun-first, inclusive spirit at ROAM events. Yet, despite all she has done to promote inclusion in mountain biking, Phelan says that she feels slightly disconnected from the industry. Here are the reflections of a wonderfully eccentric legend on a life spent on two wheels, her hopes to reintegrate with mountain biking and what the future of the sport—err, pastime—holds for women. The following interview has been edited and condensed for clarity. Why are you do you call mountain biking a pastime? I came into the pastime of using bikes as a means of transportation. And I was always careful to frame mountain biking as a pastime for that reason. I think it speaks to the rigidity of the masculine milieu around mountain biking and its gatekeepers that, for so long, women weren’t considered a worthy market because they didn’t perform to the standards of bike and sports magazines. But, when you have a global depression in 2008, suddenly women’s money becomes very interesting and people are willing to market to women. One of my most potent messages to all the women I tutored was that you can enjoy riding your bike, even if you’re scared. There’s no law that says you can’t hop off, run with your bike, and ride to live another day. But back in the day, magazines would glorify breaking collarbones. That’s not useful. To me, that was just another barrier keeping women out of mountain biking. Tell us about why you started WOMBATS. What were the first impressions of a women’s mountain bike camp? Back in the day, Outside did a column on me and they asked, “Why this camp for women?” And my answer was because the men have a club of their own. We just wanted one place to have an unmediated space for ourselves, without having to think about how we appear to some guys. I remember a cartoonist for one of the bike mags drew a comic where this mountain biker stumbles upon a WOMBAT camp in the woods, and the cartoonist clearly thought we were a cult because the camp had very witchy vibes to it—all the women are in a seance of sorts. Anyways, the guy breaks into the circle of WOMBATS around a campfire and the lead WOMBAT—which is me—strips off all his clothes and makes a sacrifice of him. It really was an amazing manifestation of this masculine fear of what happens when women get together. I certainly wasn’t prescient. I just think, because I had a certain education and formation, I saw all these killer opportunities for women who have boyfriends who liked mountain biking who wanted to try it out, but they certainly didn’t want to get hurt. And, as luck would have it, their boyfriends had all heard of me because I had bested them in races, so the boyfriends trusted me to be a teacher. And so I dreamed up the WOMBATS camps, and they were the first camps ever anywhere for women. I’d like to have one thing, maybe two, that I’m remembered for, and that’s one of them—that I was the first to do it for women. What are your hopes for the future of women’s mountain biking? I don’t have to hope for it; it’s here. I know there are American women right now taking great risk to put women [from developing countries] on bikes or incarcerated women on bicycles. These tales reach me and I’m thrilled. I wish I had the energy to still be doing that kind of thing, but I’m glad to have modeled a form of service. I think people saw me instructing clinics after I finished racing and thought, “this is what the champ does when she’s done” and maybe wanted to follow suit. I’m experiencing it now. Back when I was racing—and I had a long career—anytime a magazine talked about me, it was because I had a crazy helmet or a costume. So I’m glad that’s done. I feel this legacy aspect I have now [makes for a good conversation over] a beer or a meal, which is a great feeling. Yeah, but those costumes were pretty striking. One of the photos I came across was you in polka dot spandex with a Troll on your handlebar. So, do you still kind of identify as a rebel then? I like to think I tell the truth, and tell it flat. But mostly, I’m just an earthling.